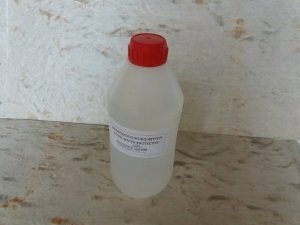 The WP-PROOFINGHYPERSTONE product is a new silicone impregnation liquid used for the waterproofing of HYPERSTONE stones. It is produced on the basis of solvents and a mixture of silanes / siloxanes and other special additives that give the product excellent waterproofing. It does not create a “skin” on the surface, it penetrates deeply, without changing its color and preventing its perspiration. The WP-PROOFINGHYPERSTONE product is applied indoors and outdoors, in bathrooms and courtyards. In addition to the Hyperstone stones, it is also suitable for: Natural and artificial stones, decorative coatings and constructions, in concrete, masonry, plaster, decorative pebbles and rock and any mineral base surface. The surfaces on which it is applied are protected from atmospheric pollution. Prevent contamination of surfaces from sludge, mud, and dust that can easily be cleaned with a simple wash. Prevents watering the stones with water and then disintegrating them due to frost. The product is applied in a sufficient quantity, with an airless paint gun or brush or roller, in two or more layers depending on the desired effect. For the first layer the product is diluted with whitespirit10% (90 product + 10 whitespirit) while for the rest the product is applied without dilution. Each layer is applied as soon as the product of the previous one is absorbed by the surface and before it dries. Full waterproofing of the surface develops after two days of application.It is not allowed to apply the material to painted surfaces and surfaces affected by solvents, while on surfaces where water is lying the product will have reduced efficiency. The product is stored in sealed containers and in places protected by weather conditions, away from radiation for two years after production.